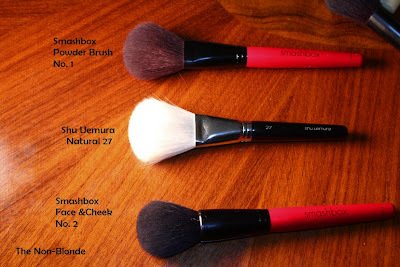 Shu Uemura label the Natural Brush no. 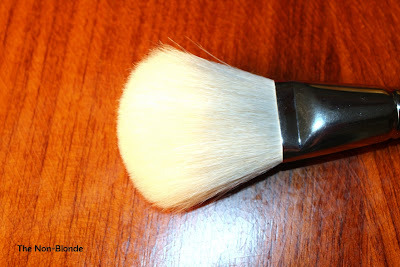 27 as a powder brush without specifying what products exactly would be best matched with this floppy and super soft goat hair brush. It's less significant when the powder brush on hand is of a common size and proportions, but a somewhat unusual brush such as the Shu Uemura Natural 27 requires a better introduction and a tip or two about putting it to good use. 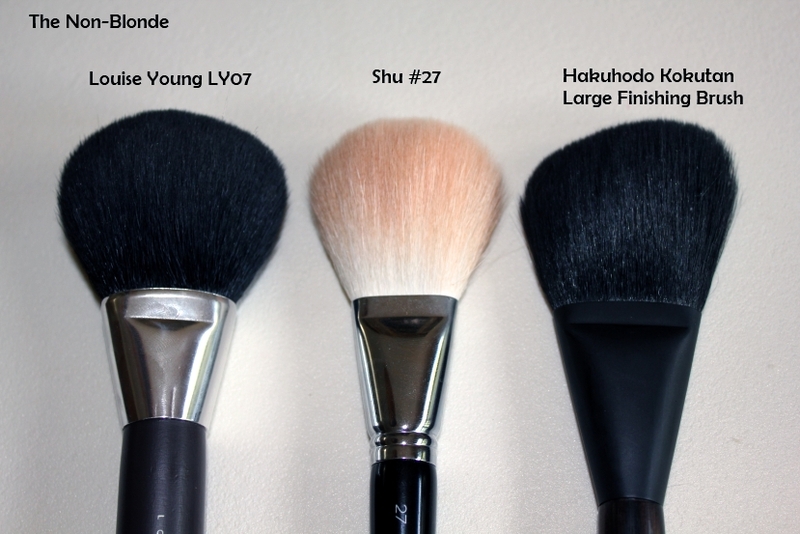 The Shu Uemura Natural 27 has longer hair than average and isn't very tightly packed, making it, as I said above, quite floppy. This means that pushing powder onto the skin is not the brush's strongest suit, though you can utilize either the bottom or the flat side. Mostly, though, this brush was made for very finely-milled products: light as air finishing powders (mostly loose one, but there are some super fine powders in pressed compacts) and even some bronzers that need a very light dusting. 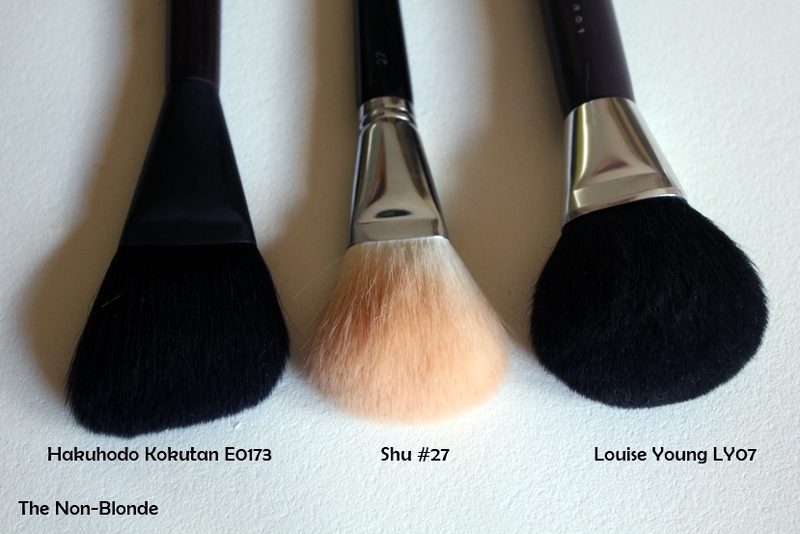 So, at the end of the day, Shu Uemura Natural 27 is an over achieving finishing brush that I use regularly, not a lame setting powder one. As you can see, when it comes to shape and size, the Shu #27 is closest to the two face brushes from Smashbox, Powder Brush No. 1 and No. 2 (Face &Cheek) (I much prefer the No. 1, by the way. 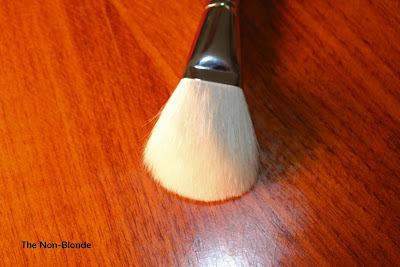 It's softer), though it's less dense and feels nicer on the skin. When it comes to performance, the Shu Uemura brush is closer to Hakuhodo Kokutan finishing brush (E0173), but it feels more like the LY07 from Louise Young (Super Powder), and shares its ability to push powder onto the skin and not just dust leftover away. The last photo with the Le Metier de Beaute powder brush (and LY07) is mostly for size comparison. The LMdB is a workhorse and can handle a larger variety of powder (and bronzer) textures, so if you'll only buy one, get the Le Metier. 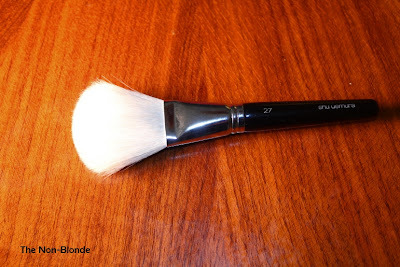 Shu Uemura Natural Brush 27 ($65) is available from shuuemura-usa.com. The rest of the world can also find it at the counters. 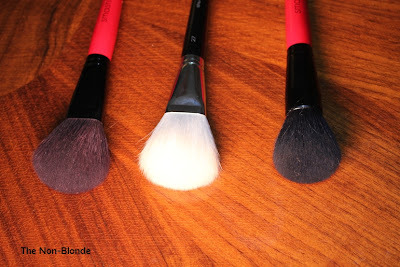 I love reading all of your brush reviews. You've made me start a list of the ones I need (and the ones I can avoid, too). I also love that you never fail to give pointers as to how each brush should/can be used and which products are most suited for it. 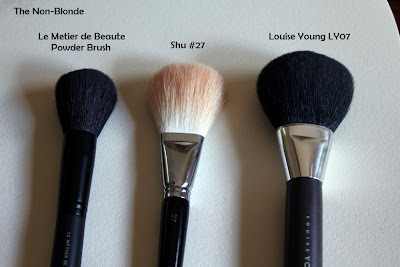 Although the Shu looks nice I'm very taken with both the Louise Young and Le Metier. 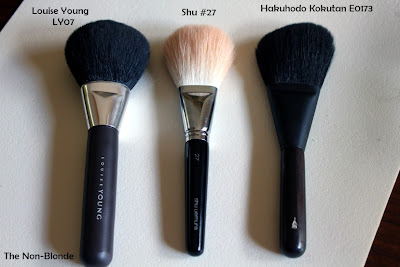 I have no 'good' large face brushes and must invest in some decent ones.